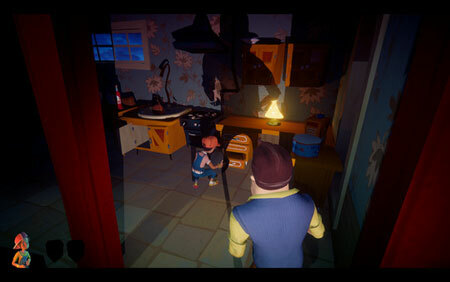 Secret Neighbor is a suspenseful multiplayer horror game from Hologryph, Dynamic Pixels. A group of kids are trying to break into their suspicious Neighbor’s basement to rescue their missing friend. Only problem is that one of the kids is a traitor – a Secret Neighbor in disguise. His job is to gain the trust of other players and betray them. Kids win if they get into the basement. Events take place between Act 1 and Act 2 of Hello Neighbor. The house is your territory. Use it to separate, scare and confuse intruders. Use your gadgets to get advantage over the kids’ team. Gain trust amongst your foes and attack in the right moment. Collect all the keys to rescue your missing friend. If you get stuck in the game, check out the video walkthrough and gameplay for the game. This entry was posted in PC Games, Walkthrough and tagged Secret Neighbor Cheats, Secret Neighbor Cutscenes, Secret Neighbor Endings, Secret Neighbor Gameplay, Secret Neighbor Guide, Secret Neighbor Hints, Secret Neighbor Horror Game, Secret Neighbor Jumpscares, Secret Neighbor Keys, Secret Neighbor Review, Secret Neighbor Solutions, Secret Neighbor Strategy, Secret Neighbor Tips, Secret Neighbor Walkthrough by Marvin. Bookmark the permalink.